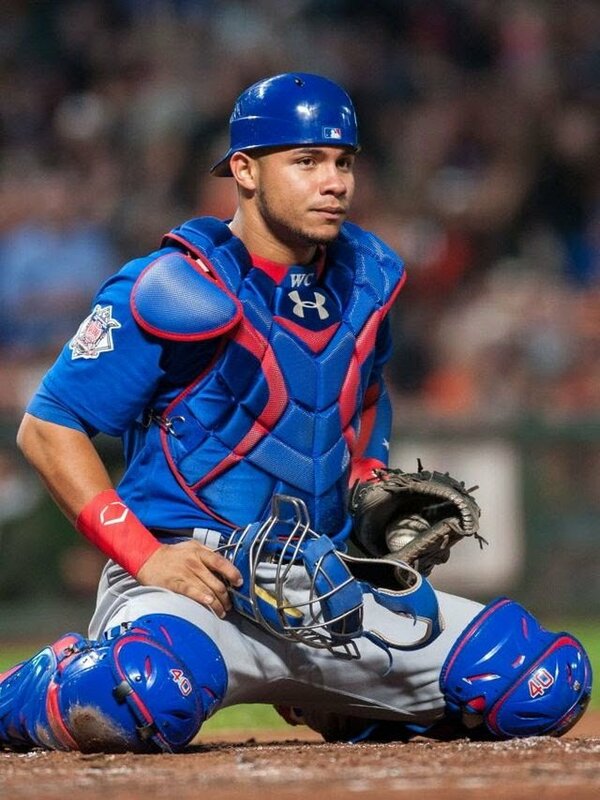 As you may have noticed over the past few weeks, Joe Maddon is trying to conserve whatever little is left in Willson Contreras’s gas tank. Victor Caratini has received a few more starts, though it hasn’t hurt that Caratini has hit pretty well and from the left side of late. Well, pretty well is relative: a 83 wRC+ in September is definitely better than the 39 he put up in August. And it’s better than the 73 and 57 Contreras put up in August and September, respectively. 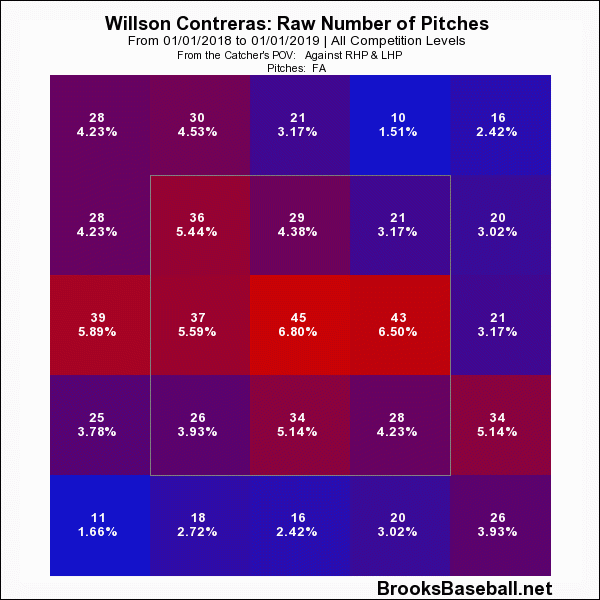 The easy answer to Contreras’s problems is that he’s simply exhausted. He’s caught the most innings in the majors this year, by 34 innings as of writing. That’s an extra four games worth of catching. Willy’s power has basically fallen off a cliff and caught fire and had its heart broken since the halfway point, with slugging marks of .471 in July, .300 in August, and a shoot-it-to-put-it-out-of-its-misery .250 in September. His contact-numbers suggest that isn’t wrong or a crime either. Willy had a 18.9% line-drive-rate in August, and in September it’s a Dear-God-Get-It-Off-Me 4.2%. If there’s something to be encouraged by, and this is a reach, is that his hard contact rate in September is 32%. The problem is it’s literally all on the ground. He has a 75% groundball rate in the season’s last month, which doesn’t even sound possible, but here we are. So all of that would lead you to conclude it’s tiredness. After all, Willson only caught 821 innings last year thanks to that hamstring injury. So the 1100 is an increase of 36 percent. It’s a lot. Catchers who have had near the same load this year are having some of the same problems. Jonathan Lucroy turned to cardboard basically after the All-Star break. Yasmani Grandal really only had a hot June, and has been a garbage fire when at the plate the rest of the season. Tucker Barnhart has a 23 wRC+ in September. The only exception is Yadier Molina, because of course it is, who has a 135 mark in September so far. The thing is, Contreras’s workload is high but it’s not obscene. Last year, two catchers caught over 1100 innings and four over 1000. Martin Maldonado led the league, but he’s never been an offensive-plus. Yadier caught 1100+ innings as well, and he fell off offensively in September as well, going from a 135 wRC+ in August to a 91. J.T. Realmuto caught 1095 innings last year, and saw his offensive production tank in the season’s final two months. 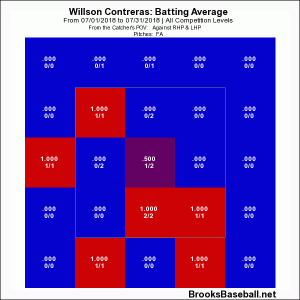 Matt Wieters also broke four-digits, but he was woeful offensively all season. Two years ago Molina caught over 1200 innings, and actually had his best offensive month in September because he’s an alien sent here specifically to annoy us. Realmuto caught over 1100 and saw his wRC+ drop in September of that year to 103 after being concisely in the 120s. It was the last time Buster Posey went over 1000 innings behind the plate, and he saw his wRC+ crater to 85 and was probably the impetus to get him more time at first from here on out. Wilson Ramos caught over 1000 innings two years ago and he saw his marks drop below 100 in both August and September that year after being well above it for the first four months of the season. So it does appear that unless you’re a Molina and you were specifically designed to catch (and complain), once you cross the 1000 innings threshold and get closer to 1100, fatigue wreaks havoc with your offensive production. Or at least you could suggest that. 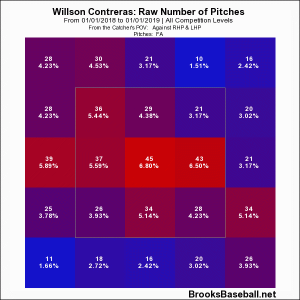 Combine that with the fact that Contreras has forgotten his all-field ways of July. In that month, Willson put nearly 40 percent of his balls in play to the opposite field. The past two months it’s that same percentage but to his pull side, and with pitchers more focused on staying outside, he’s just rolling over basically everything. 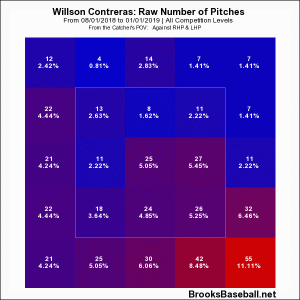 Which might be why Willson has an 82 percent ground-ball rate on balls he pulls the past six weeks. Fatigue could be a big reason, but it can’t be the only one for the sinkhole he’s become. And catching 1000 innings is going to be the norm for Willson from here on out, at least you’d hope. He, and the Cubs’ coaching staff, are going to have to find some answers and stem that fatigue in future seasons.